The globalization of finance is widely recognised as one of the most significant features of the contemporary world. In this timely new book, Tony Porter guides students through current debates about global finance and discusses the extent to which the development of a global marketplace affects our daily lives. 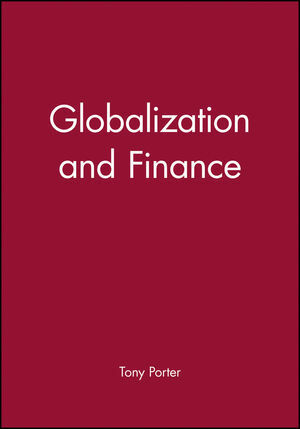 He examines the complex networks of public-sector and non-governmental institutions and practices that facilitate the globalization of finance and provide an emerging set of arrangements for regulating it. The book is both comprehensive and innovative, and includes chapters on banking, securities markets, foreign direct investment, private authority, the role of developing and transition countries, global civil society, gender, the politics of risk practices and financial crises, and democracy. Written for students approaching the topic for the first time, this book provides a coherent, empirical and theoretically rigorous introduction to the governance of global finance. Tony Porter is Associate Professor and Chair, Department of Political Science at McMaster University. Chapter 1 Introduction: Why Study Global Finance? "Tony Porter's book presents an interesting viewpoint on globalisation and global finance....The narrative is a rich mixture of history, institutional economics, international finance and social science including political science." Provides a timely and accessible introduction to the governance of global finance. Discusses the extent to which the development of a global marketplace affects our daily lives. Written for students approaching the topic for the first time. Includes chapters on banking, securities markets, foreign direct investment, private authority,the role of developing and transition countries, global civil society, gender, the politics of risk practices and financial crises, and democracy.